US automotive brand Chevrolet has begun deliveries of its electric vehicle Bolt EV to the brand’s dealerships across the UAE. 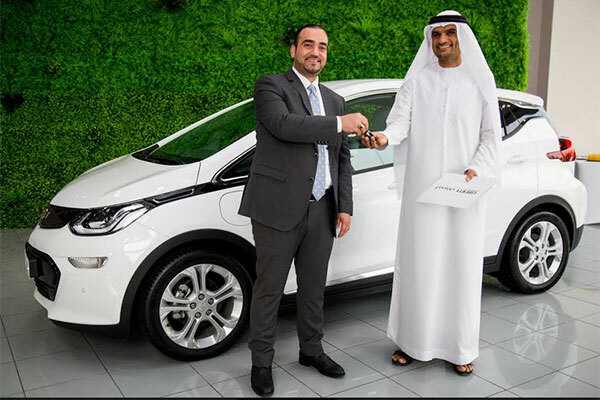 Liberty Automobiles, one of the official Chevrolet dealers in the UAE, kick-started deliveries this month as they handed over the keys to the first Bolt EV customer, Saeed Obaid Juma Al Leem Al Ali. The Chevrolet Bolt EV is the brand’s first electric vehicle in the region and the first electric vehicle ever to combine clean technology with an anxiety-free range of over 500km on a single charge. Molly Peck, chief marketing officer at General Motors – Middle East said: “Since its reveal to the region in November of last year, our Chevrolet Bolt EV has received an overwhelmingly positive response and we have no doubt this will increase as vehicles continue to arrive across our showrooms in the region. Whether it is zipping through the city or tackling longer road trips down to Oman, the Chevrolet Bolt EV delivers spacious comfort and reliability paired with a 204 horsepower and 360 Nm of torque delivering speed and acceleration from 0 to 100 km/h in 7.3 seconds. Additionally, with the reduced service requirements of its electric drive, the Chevrolet Bolt EV offers an exceptionally low cost of maintenance. Likewise, government initiatives offering free parking, free registration for EVs, free Salik tags as well as free charging at Dewa-approved stations until end of 2019 add to the cost benefits of owning an electric vehicle.